The other day Ramana wrote about his favourite chair. In the post not alone did we see photos of it, we also saw a picture of the younger man and his beautiful late wife Urmeela. We learned a little more about their life together as well as the history of the piece of furniture. In true Ramana fashion, he threw down the gauntlet and asked if we had a favourite piece of furniture to show & share…. It was purchased as a gift before I was even a gleam in my father’s eye. It was a gift for a woman. A woman I never had the opportunity to meet. The fact that she loved and cared for it was enough for me. It may be my treasure at the moment, but I am really a temporary guardian until the day when I pass it on to the next generation. It arrived into its first home in several pieces and when put together there were no nails needed. Wooden dowels were the means of locking the sections together. It is an occasional table. A very, very unusual occasional table. The wood is dark but not ebony. 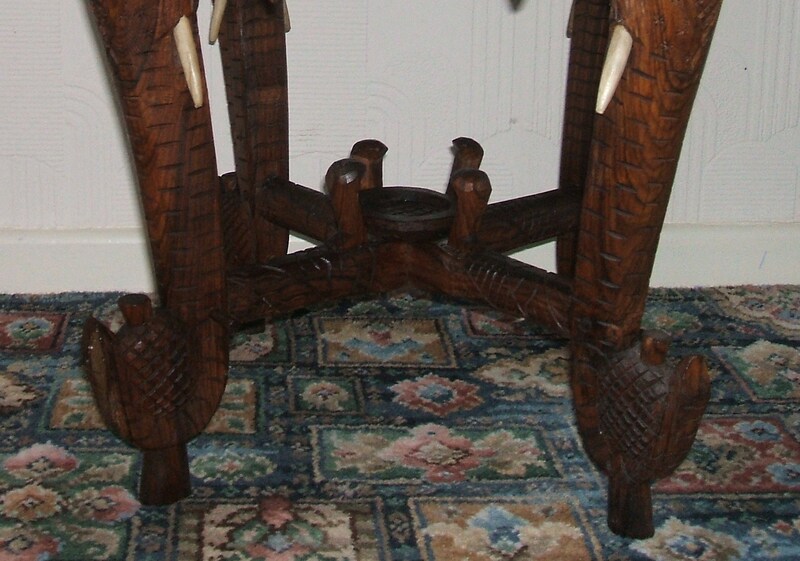 Each of the four legs is carved into the shape of an elephants head with added eyes and tusks in ivory. Alas, one of my predecessors was not over fond of the table and made it the home for an indoor plant that was housed in a heavy black metal three legged pot, the type used in Ireland for cooking on open fires many generations earlier. 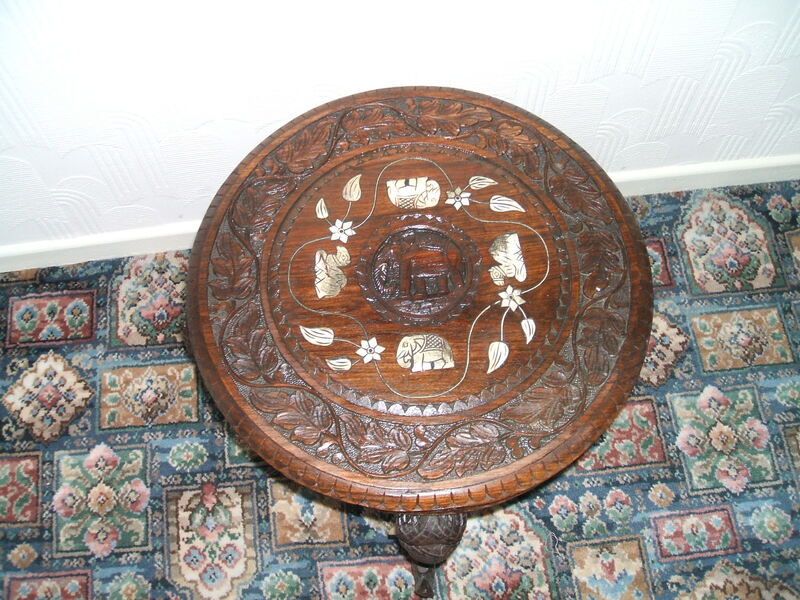 The legs of the pot caused irreparable damage to the inlaid Ivory on the table top. The weight was in the table top which was all one piece. The legs were attached to the underside of the top and to four connecting cross bars with a central decoration like a little wooden dish. At the edge of this dish were four shapes that look like snake heads. Is that a pineapple sitting in the end of the trunk? 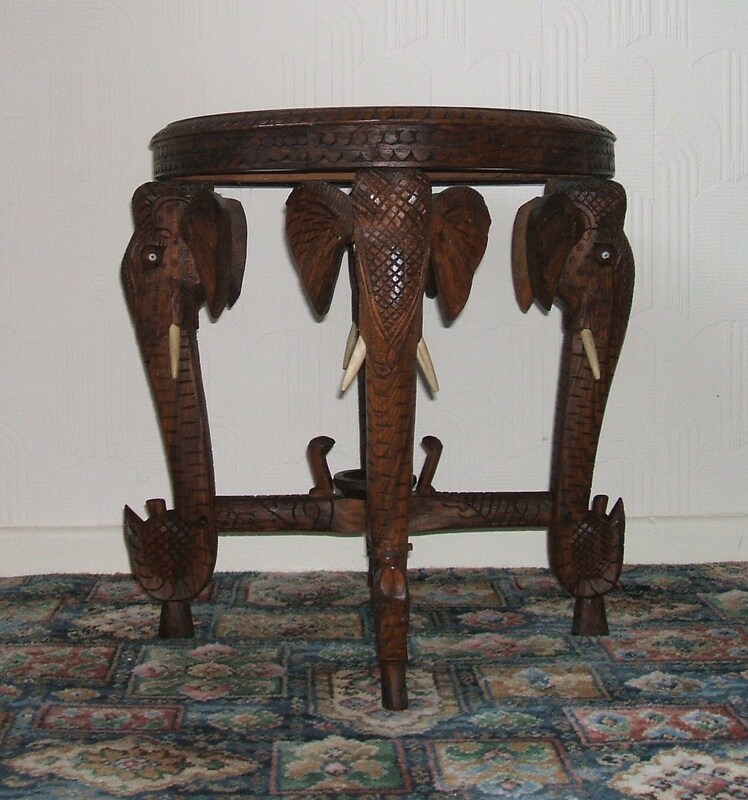 The table was purchased by Jack during his war time service in India, before he moved on to Burma. He had it sent home to his beloved mother in the North East of England. I am sure that when the parcel arrived it was rather a shock, firstly to receive such a gift but it would also be an indication for his parents as to what country he was in. Back then letters home were not alone very slow, but censored and no mention of where the sender was stationed was allowed. Unlike today, where those at war have mobile phone and email access with their families, back then families did not know where their loved ones were. Jack told me a story once in the wee small hours of the morning, when the ghosts of torment and nightmares wander achingly through the dark, that his mother sat up in bed one night and shouted to his father “Something has happened Our john!”. The story was confirmed at a later stage by his aunt who also added that on that night Clara’s (Jack’s mother) hair turned white. It was months before they were told that he was injured and back in hospital in Lincolnshire, England many miles away from home. This entry was posted in Blogging, memories on July 14, 2009 by Grannymar. Not wanting to throw kittens amongst pigeons or anything, but why wouldn’t Turkish people know about Elephants? Maybe the myth regarding upturned trunks comes from African elephants rather than Indian ones?? Barbara – I don’t have any answers, but it makes a good story! useful sites on the internet. I most certainly will highly recommend this website! HI !! I write from France, so sorry for the bad language ! 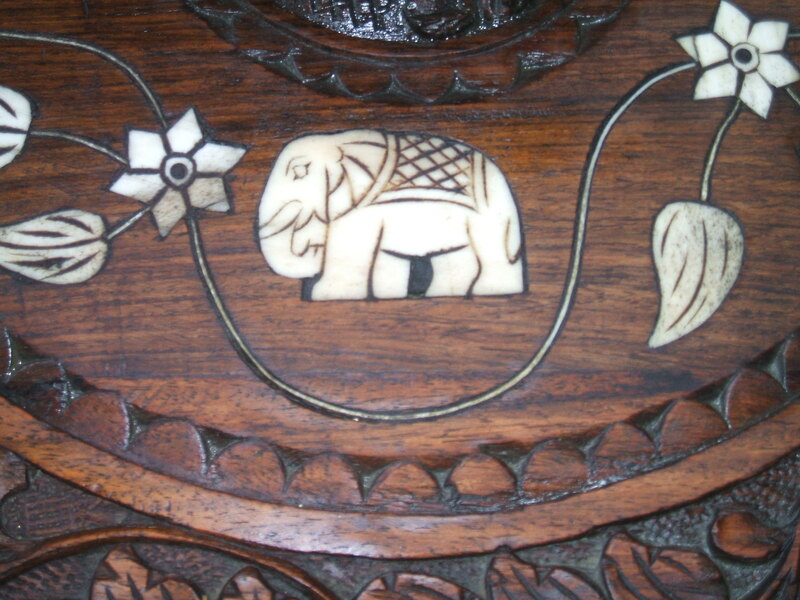 I’ve got exactly the same table from my father (just some details changes, like mine have no “flowers” on the elephants heads. Really want to know the history and the age of the piece of history !